The Pharmacy Distribution Services Provider was looking to reinvent its brand and expand the new way they do business. The company realized the “face” of their competition has been changing. Many buyers – including a 20-year customer - are considering in-house solutions for their pharmacy distribution. 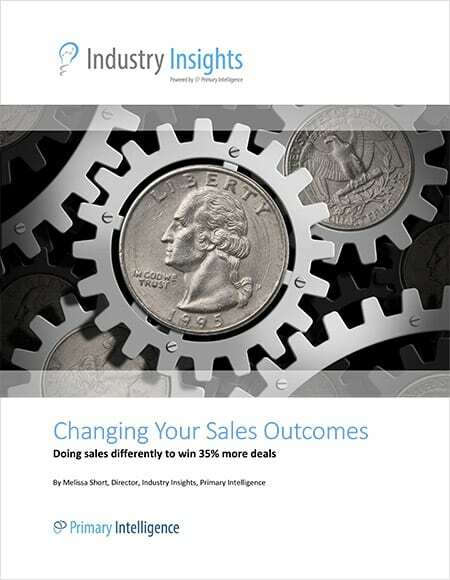 After implementing Primary Intelligence’s Win Loss and Customer Experience programs, this pharmacy company finally grasped why they were losing accounts. They were having issues with a specialty drug offering and poor delivery times and struggled with unresponsiveness from the executive team. Together with their Primary Intelligence team, the Pharmacy Distribution Services Provider created a more specific plan to help address the customer’s business needs and resolve their concerns and was able to retain a multi-million-dollar account with more to come. This Pharmacy Distribution Provider knew they needed to branch into different parts of the health care industry and no longer wanted to be viewed only as the distributor anymore. Instead, they wanted to be a partner and be seen as a provider in the healthcare industry when working with customers who they have already been dealing with on the distribution side of the business for a number of years. The Pharmacy Distribution Provider had to make sure they have the right solutions that fit the needs of their customers today. "We're not trying to repackage our old solutions, but trying to expand those and see if they fit our customers today." "We were trying to increase our win ratio and we've heard from the sales team they need more information on why we are losing certain accounts." The Pharmacy Distribution Provider has collected and took action on many discoveries. For example, the account team had a meeting scheduled with a long-time customer to discuss their contract renewal. In an effort to be better prepared for that meeting, they asked Primary Intelligence to conduct an in-depth Customer Experience interview. The Primary Intelligence team scheduled a conference call with four different buyers, including the main decision makers and those who would be involved in the upcoming meeting with this Pharmacy Distribution Provider. The Program Consultant said the issues discussed were extensive. He set up a meeting to review the findings with the sales team. They were shocked at the feedback and issues mentioned by this long-time customer. Some issues they were aware of, while others came as a complete surprise. Issues such as responsiveness by the executive team in answering difficult contract pricing questions, issues with this provider’s specialty drug offering, and delivery times. The customer had also made a comment about potentially being able to take care of their own pharmacy distribution needs, which was very alarming for the team. The account team was able to take the feedback and create a more specific plan to help address the customer’s needs and resolve their concerns, ahead of an onsite meeting with them. The Pharmacy Distribution Provider is pleased to have retained this multi-million-dollar account and maintain their 20-year relationship with their customer. The director praised Primary Intelligence, saying, "We didn't even have a Win Loss process before, so Primary Intelligence has been excellent at educating us. They're the ones who led us in the direction of getting key buying decisions. Now that's like a very popular buzzword around here. They've been a great resource. They're very timely and very actionable. I just think the partnership would be the keyword. It's like, 'Oh, he's another vendor we're working with.' It's more like, 'Here is a partner we're working with.'"